The residence is located directly on the slopes and near the centre of the resort. Slopes on the doorstep of all buildings. The residence includes a shopping area. Val Thorens, the highest ski resort in Europe. The residence benefits from being at the foot of the slopes and in the heart of the resort. Plus the residence is equipped with a fitness area. 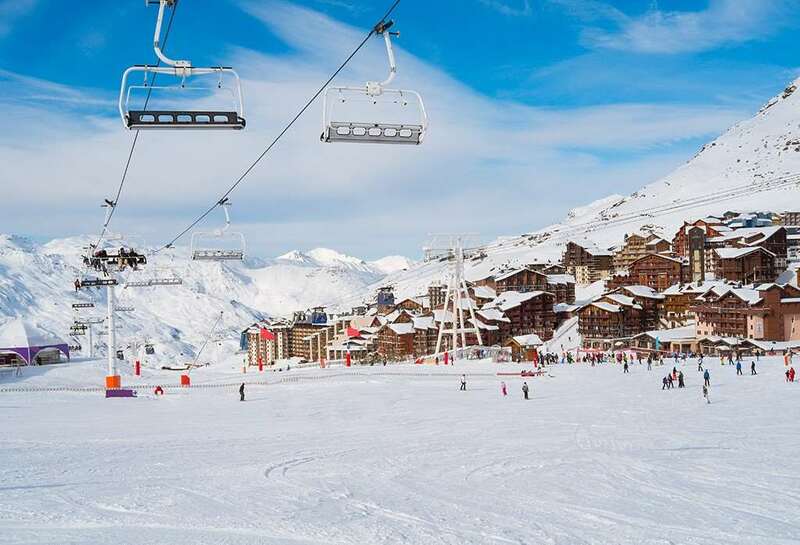 A number of activities are available both in the residence and local area such as: The 3 valleys (Saint-Blon, Les Allues and Belleville) are connected by lifts and slopes. Val Thorens offers exceptional snow conditions catering for all kinds of snow sports and at all levels. Off the slope activities include: tennis, squash, fitness, well-being and relaxation centre. For thrill seekers: snowshoe walks, tobogganing, paragliding, microlighting. The "La Grange" restaurant offers traditional fare. You can book a meal plan before your departure. "Savoyard" and "Italian" nights are organised on a regular basis. Opening hours of the reception: Main reception open everyday 24/7. Please note: subject to change, please contact the residence before your arrival. From studios for 4 people to 2 bedroom apartments for 6/7 people. No internal or outside phone line. Separate WC except in studios for 4 people and some 1 bedroom apartments for 4/5 people. Accommodation description : 1 living room, 1 sleeping alcove, 1 kitchenette, 1 bathroom and 1 toilet. Living room description : 2 sofa beds and 1 sleeping alcove with 2 bunk beds. Description Kitchen : Kitchenette opens out onto the living room. Bathroom description : 1 shower or 1 bath and 1 toilet. Description Others : Orientation: South or North. Accommodation description : 1 living room, 1 bedroom, 1 kitchenette, 1 bathroom and 1 toilet. Living room description : 2 sofa beds. Description Bedrooms : 1 bedroom with 2 single beds or 2 bunk beds. Description Kitchen : Kitchenette opens out onto the living room. Bathroom description : 1 shower or 1 bath and 1 toilet. Description Others : Orientation: South or North. Accommodation description : 1 living room, 2 bedrooms, 1 kitchenette, 1 bathroom and 1 toilet separated. Living room description : 2 sofa beds, one of which includes a pull-out bed (recommended for children). Description Bedrooms : 1 bedroom with 1 double bed and 1 bedroom with 2 bunk beds. Description Kitchen : Kitchenette opens out onto the living room. Bathroom description : 1 shower, 1 bath and 1 toilet.